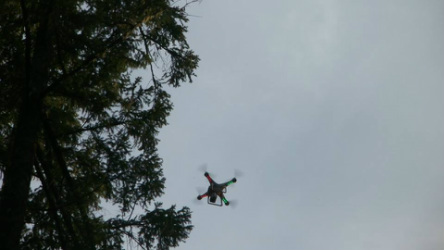 Dean Hawn flys a helicopter with a camera attached (technically a drone) above the canopy of crepsi forests. Interested in seeing what this helicopter-drone was recording? So are we. See you December 7th! We are working towards the creation of a 110 acre wild lands preserve, high on the Siskiyou Crest! Proceeds from this show go directly towards the creation of this preserve. Dean is the man of the hour at the film premier on December 7th, as 10 months of interviews, filming, editing, planning, networking, music and art coalesce on the screen as a film documenting these times. If you have been watching these scenes unfold, or if you have been participating in the movement to preserve a 110 acre tract of second growth forest.. If you want to see what this Speak for the Trees thing is all about (or just have some fine beer from Yale Creek Brewing, eat some popcorn grown by one tome powell, have a ham sandwich with meat from Bygeorge farm, prepared by jay may may and watch a film, finely crafted by Dean Hawn) then saturday is a day for you to anticipate with warm heart. At 5 oclock the silent auction starts. A fine array of crafts, knitted, sewn, sawed, cooked and sanded will present themselves from 5 til after the film has been shown, around 8, when we will tally the bids. After the tally, Trever Jones will take the stage, as this kind hearted fella of strong voice and rhythm has each time that a musical speak for the trees event has happened since round one (we have asked stevia to preform with mr. jones as well, keeping fingers crossed.) $5 at the door gets dean a ticket from the city of angels to the little applegate and back. Looking forward to another fantastic event. SPEAK FOR THE TREES!! Watch this space to view the trailer! August 31st at Full Bloom just keeps getting better! The Bindle Stiffs are rolling out from Reno with a whole crew. I can tell you folks, just because the stiffs are from the Phx/Reno desert don't mean they are dry! And speaking of wet, can you imagine how good the two Full Bloom ponds will feel on a scorching August day in the middle of summer, tall frosty beers from Yale Creek Brewery in hand? Chant Thomas of Trillium Farm is preparing to be the auctioneer for an hour or so, we would be hard pressed to find a more informed and charismatic master of ceremonies. Stepping up to the plate for a third Speak for the Trees shindig, long time defender of forests Trever Jones. And... hesitant to say it (fingers crossed) word on the streets is that Jammal Tarkington has agreed to roll out with the Stiffs to dj the night into a proper party of dance. Jammal is a proper music pro, with a decade of touring the globe in bands under his belt. Much, much, love to Full Bloom for letting us put this event on, and also to Rise Up! Artisan Bread for cooking up pizza pies in the wood fired bread oven. 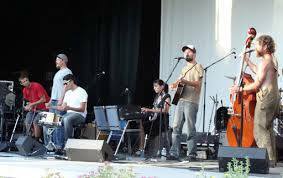 Did you show up at wolf gulch in May? Expect the same euphoric feel at Full Bloom. Please share (both on facebook, and ideas for the planning) Be a part of this, all proceeds go directly towards the preservation of 110 acres of high Siskiyou forest. We get closer every day!! 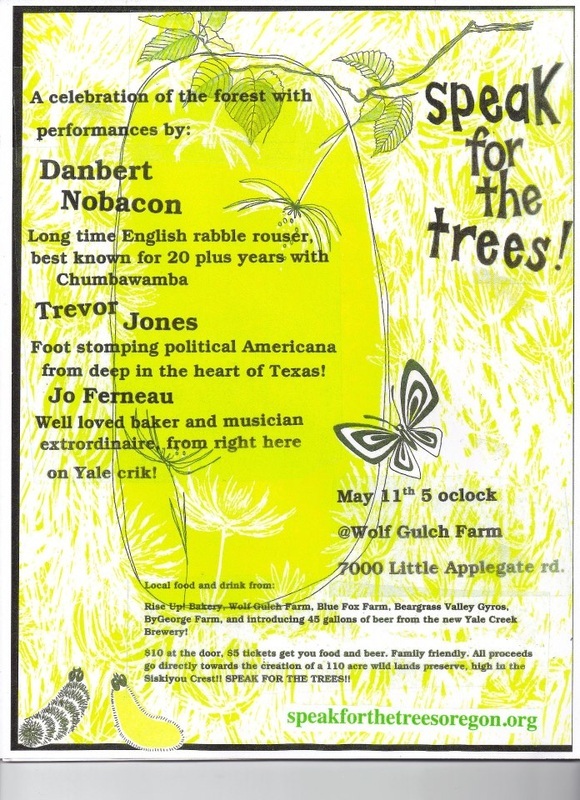 A celebration of the forests, with performances by Danbert Nobacon, Trever Jones, and Jo Ferneau. In addition, Maud Macrory Powell will be celebrating her 27th birthday, punctuated by a square dance with a live bluegrass band. Delicious organic food and drink will be served at reasonable rates, donated and prepared by farmers, bakers and badasses from the Applegate Valley, (RiseUp Bakery, Wolf Gulch Farm, Blue fox Farm, Beargrass Valley Gyros, By George Farm and Yale Creek Brewery among them). $10 at the door, $5 tickets get you pizza, gyros, salad rolls or beer and cider. ALL FROM THE BLOCK!! 7000 Little Applegate road, come one, come all. We eat, we drink, we dance and sing!! We are working towards the creation of a 110 acre wild lands preserve, high on the Siskiyou Crest! All proceeds from this show go directly towards the creation of this preserve. If you are out of towners, write regarding accommodations, of which we will provide for all who come. (tents and sleeping bags!) Campfires in Crepsi, the beauty and vibrance of spring to remind us for which we fight! Love and light!! Our spirits rise with the sap in the cambium. This presentation is a benefit for Speak for the Trees. All proceeds go directly to create a 110 acre wild lands preserve, deep in the Siskiyou Mountains. Tom Ward is a long time resident of the Little Applegate valley in Southern Oregon. First settling there in the early 70’s, Tom has been advising farms and teaching Permaculture for over 30 years. He has degrees in Forestry and Botany from Syracuse University, and has taught dozens of permaculture courses over the last 30 years, primarily in Southern Oregon and northern California. He presently manages a Social Forestry experiment station outside of Jacksonville OR, where he demonstrates natural building, fuel hazard materials utilization, wood crafting, wildlife habitat enhancement and desert forest water management. He is the author of Greenward Ho! Herbal Home Remedies: An Ecological Approach to Sustainable Health. This is Dean Hawn. He is a brother from Arizona who has spent the last decade as an editor in Los Angeles. When we met up a few monthes ago in Portland the topic of wild forests was hot on our tongues. Dean flew home, and shortly thereafter booked a ticket to Medford. He flew up last weekend, met the family and begun to document the biology, history and actions of defending these forests. He is helping to take it one step further, creating a wild lands preserve for the generations who follow. We owe him much gratitude and look forward to sharing this film with you. Everyone has a gift, Dean is using one of his to save a corner of this planet.